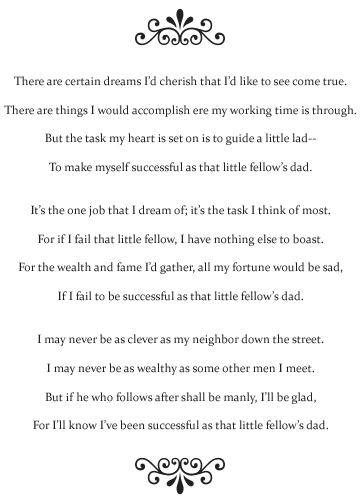 The following poem has been taped to my dad’s desk for as long as I can remember. Now that I’m the mom of boys (and the wife of a man who is a very good dad to boys), it’s especially meaningful to me. I can’t get all the way through it without a lump in my throat. There are certain dreams I’d cherish that I’d like to see come true. There are things I would accomplish ere my working time is through. To make myself successful as that little fellow’s dad. It’s the one job that I dream of; it’s the task I think of most. For if I fail that little fellow, I have nothing else to boast. If I fail to be successful as that little fellow’s dad. I may never be as clever as my neighbor down the street. I may never be as wealthy as some other men I meet. For I’ll know I’ve been successful as that little fellow’s dad. Ooh, thank you. The JPEG worked great and it’s very beautiful too. Thank you so much for sharing that. It turned out great! That is such a sweet poem. I praise the Lord for my hubby – a wonderful Dad. I only found it once written exactly as yours is and it said author unknown. It is a great poem, thanks for sharing! we’re expecting our first little fellow in the middle of january. my husband is so excited to be a dad — and he’ll be a great one. Thinking I’m gonna tweak that (“that little fellow’s dad” to “these little Vikings’ dad”) and save it for next June! Oh! Thanks for sharing this one – great poem! Love this–gonna have to print this up! Oh Shannon.. This is so timely! Tomorrow’s my husband’s birthday and my son and I were going to get busy making him birthday cards as our art project tomorrow. I think this will be the entry in Daddy’s card. So lovely! Thanks for sharing! I just love this. Love it, love it, love it. Got three little lads and a fantastic one raising them, and this will be perfect for his birthday next week. such a nice poem. I always remind myself that at the end of you my life I’ll never say, “I wish I had worked more or made more money.” This helps me to staye focused on what’s important. Thanks for sharing the file. It is going to become a Christmas present now! Thanks. So sweet of you to share. Thank you. Love this..how true it is! Thank you for reminding me how blessed I am to have such an amazing husband. He loves God, me and our children tremendously. Thanks for sharing a great poem! I am going to give it to my husband. This is so sweet. We’ve got four little (big) boys…I think this would be great for my husband. Thank you. The lump in my throat is huge. My little ones are at this moment, painting birdhouses for their Daddy’s birthday. I know he would love this poem to go along with them. Thank you so much. I made a framed copy of this for my hubby probably 22 or 23 years ago. It was always in his office as one of his favorite pieces. I think the author may be Gloria Gaither. At least that is where I got it years ago. What perfect timing! After a hectic week ending in oral surgery for my son, my husband’s birthday snuck up on me today. You (and our God, who orchestrates all things) have tears in my eyes.